Sitting by my pond... the first water lily is out. It looks like it's carved from wax, the insects love it. the moment the sun goes down it closes up, I hope the bugs get out in time! A rare treat. I don't often spot the resident newt. I'm hoping it's a female. A couple of years ago I was lucky enough to observe one laying her eggs. She gets into just this position on a leafy strand of pond weed, lays a single egg at a time and wraps it into an envelope of leaf which she makes with her two hind legs - then moves on to the next leaf. 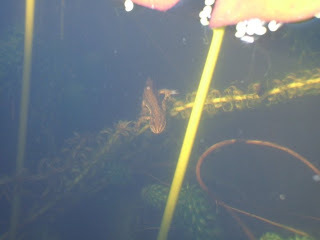 You will have to keep us updated on the little newt! 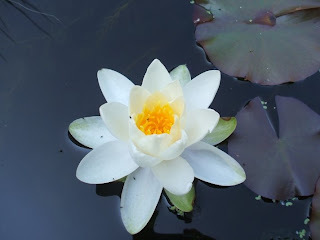 That water lily does look like it is carved from wax - beautiful! Isn't nature fascinating? Thanks for sharing the pictures. I'll be watching for more. 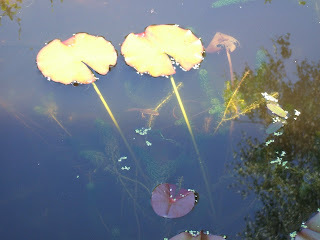 I love waterlilies... and that newts pretty cool too! Tomorow I'll be tagging you on my Crafts of texture Blog. I am awarding you with a One Lovely Blog award. This was awarded to me by Madam Salami. Now, I'm passing it on to you because I love your blog! 2. Pass the award to 15 other blogs that love and/or have newly discovered. 4. Use the One Lovely Blog award picture from my blog, on your blog to let everyone know that you have one lovely Blog!